The best way to wash & clean your luxury bed sheets. 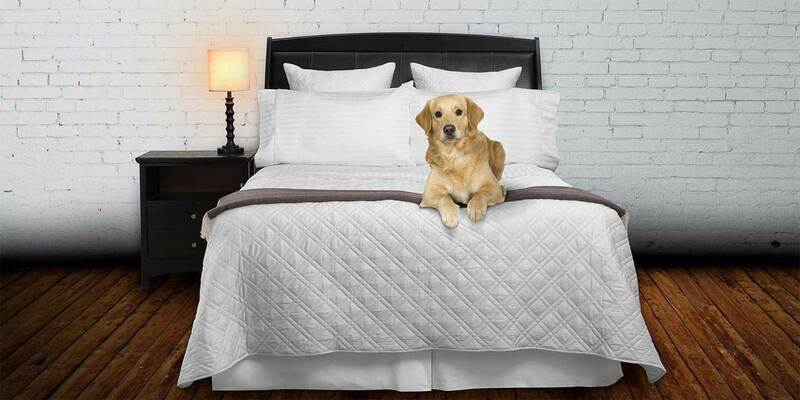 Use code - bedding tips - at checkout & get 5% off your entire purchase. Luxury Linens are an investment and they are often more expensive than your ordinary department store bed sheets. However, maintaining luxury linens does not require much additional effort. Because luxury linens are an investment, it is important to care for them properly. Taking just a few easy steps can extend the life of your luxury linens for several more years. Here are some easy-to-follow tips that can extend the life of your luxury linens and help them maintain a super-soft feel. Use warm or cold water and wash in a gentle cycle. Do not overload washing machine as it can bring additional tension to the fabric. Many detergents, like Tide or Cheer, contain brighteners, which are bleach derivatives. Bleach is hard on cotton fiber. A good rule of thumb is – only one set of sheets in the washer or dryer. Use a mild detergent, such as Ivory, Dreft, or Le Blanc Linen wash; which is sold on our site, here. 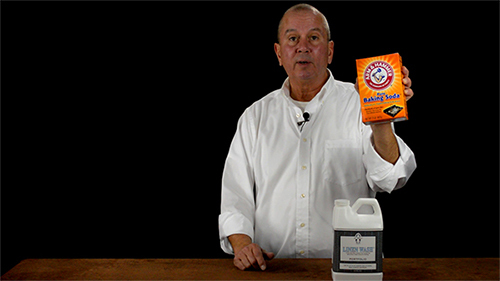 Start your washer and then add detergent. Allow the washer to fill at least halfway before adding your bed sheets or duvet cover. Linens sometimes can discolor or develop a musty odor. This is attributed to not getting them as clean as they should be. To fix this, wash just one set of sheets in the load. Every month or so, add a ½ cup of baking soda to the wash cycle as this will keep linens whiter and fresher. Refrain from using excessive amounts of detergent because it might not completely rinse and will coat the fabric, creating a rough feel. Soap can also absorb debris, such as dander and body oil, which can cause discoloration and an odor. If you suspect you have used too much detergent when washing your sheets, run them through the wash cycle while using only a 1/2 cup of white vinegar (no detergent). Then, wash them over again using the correct amount of detergent. If you find spots on your linens, pour a small amount of detergent in a cup and dilute it with some water. Then, begin to pre-spot accordingly. Never use chlorine bleach on your linens, as the bleach will damage and degrade the cotton fiber. Use a low to medium heat setting when drying. Insert one set of sheets per load. Remove your sheets from the dryer when they are slightly damp to the touch. 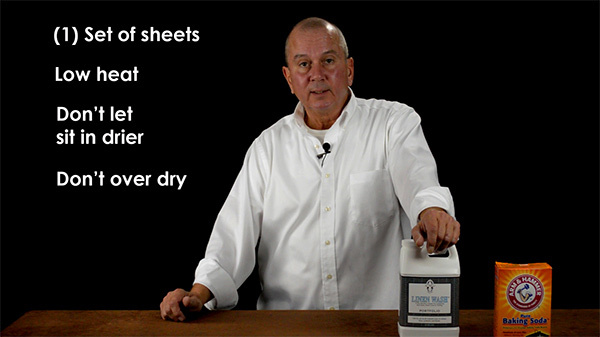 Don’t over dry your sheets. Do not leave sheets in dryer when the cycle is complete, as this will create excessive heat and more wrinkles. Excess heat can damage your sheets. Hand press your sheets when folding them up, or put them directly on the bed. Vero Linens is ready to fit your bed with fine bed linens that will provide you with years of comfort. Choose from our fine Italian linens, luxury duvet coverts, down sleeping pillows and much more. Here is a video on how to easily remove wrinkles without using an iron. 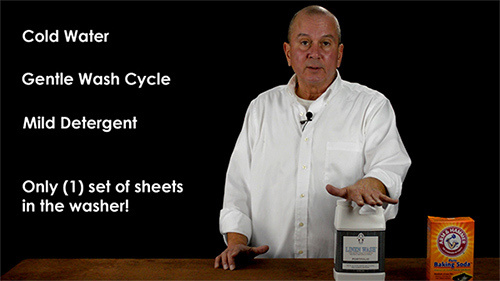 Be sure to check out our dozens of other videos and article on bedding tips found here. To shop for the finest luxury linens and luxury bedding, click on the below shop button. Have questions? Email us with any of your bedding related questions.